The Hammond Oak, located in the 500 block of East Charles Street: The grave of founder Peter av Hammerdal (Peter Hammond) is under this tree. 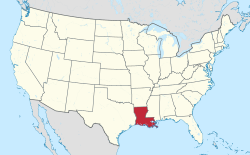 Hammond is the largest city in Tangipahoa Parish, Louisiana, United States, located 45 miles (72 km) east of Baton Rouge and 45 miles (72 km) northwest of New Orleans. Its population was 20,019 in the 2010 census. Hammond is home to Southeastern Louisiana University and is the principal city of the Hammond Metropolitan Statistical Area, which includes all of Tangipahoa Parish. The city is named for Peter Hammond (1798–1870), the surname anglicized from Peter av Hammerdal (Peter of Hammerdal) — a Swedish immigrant who first settled the area around 1818. Peter, a sailor, had been briefly imprisoned by the British at Dartmoor Prison during the Napoleonic Wars. He escaped during a prison riot, made his way back to sea, and later on arrived in New Orleans. Hammond used his savings to buy then-inexpensive land northwest of Lake Pontchartrain. There, he started a plantation to cultivate trees, which he made into masts, charcoal, and other products for the maritime industry in New Orleans. He transported the goods by oxcart to the head of navigation on the Natalbany River at Springfield. He owned at least 30 slaves before the Civil War. Peter Hammond lost his wealth during the war, as Union soldiers raided his property. In 1854, the New Orleans, Jackson and Great Northern Railroad (later the Illinois Central Railroad, now Canadian National Railway) came through the area, launching the town's emergence as a commercial and transport center. The point where the railroad met the trail to Springfield was at first known as Hammond's Crossing. Peter Hammond's grave is near the center of town under the Hammond Oak, along with the graves of his wife Caroline Hammond (née Tucker), three of their children, and a favorite slave boy. 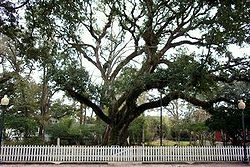 The Hammond Oak is a member tree of the Live Oak Society. During the Civil War, the city was a shoe-making center for the Confederate States Army. The shoe-making industry was the work of Charles Emery Cate, who bought land in the city in 1860 for a home, a shoe factory, a tannery, and a sawmill. Toward the end of the war, Cate laid out the town's grid, using the rail line as a guide and naming several of the streets after his sons. Also, Cate Street is named for him. After the Civil War, light industry and commercial activities were attracted to the town. By the end of the 19th century, Hammond had become a stopping point for northern rail passengers traveling south and for New Orleanians heading north to escape summer yellow fever outbreaks. The city later became a shipping point for strawberries, so a plaque downtown gave it the title of "Strawberry Capital of America". In the 1920s, David William Thomas edited a weekly newspaper in Hammond prior to moving to Minden, the seat of Webster Parish. There, he was elected mayor in 1936. In 1932, Hodding Carter founded the now-defunct Hammond Daily Courier, which he left in 1939 to move to Greenville, Mississippi, later receiving a Pulitzer Prize for his reporting on the Civil Rights Movement. Since 1959, The Daily Star has been Hammond's locally published daily newspaper. During World War II, the Hammond Airport (now Hammond Northshore Regional Airport) served as a detention camp for prisoners of war from Nazi Germany. Additionally, the U.S. Army established and used the 15,216-acre (61.58 km2) Hammond Bombing and Gunnery Range east of the city. Today, Hammond is intersected by Interstates 12 and 55. Its airport has a long runway which serves as a backup landing site for Louis Armstrong New Orleans International Airport and serves as a major training site for the Louisiana Army National Guard, as well as the home base for the Louisiana Air National Guard's 236th Combat Communications Squadron. About 15 mi (24 km) south of the city, on both the railroad and I–55, lies Port Manchac, which provides egress via Lake Ponchartrain with the Gulf of Mexico. The combination of highway-rail-air-sea transportation has transformed modern Hammond from a strawberry capital to a transportation capital. The city hosts numerous warehouses and is a distribution point for Walmart and other businesses, and Southeastern Louisiana University in Hammond offers the state's only academic degree in supply chain management. In 1953, John Desmond opened the first architectural firm in Hammond. He was chief architect of the Tangipahoa Parish School Board for some two decades before he relocated to Baton Rouge. New Orleans attorney, political activist, and state government watchdog C.B. Forgotston relocated to Hammond in 2006. Lawson Swearingen, a former Democratic member of the Louisiana State Senate and a former president of the University of Louisiana at Monroe, resides in Hammond, where he is a professor of management at Southeastern Louisiana University. Among the city's cultural resources is the Tangipahoa African American Heritage Museum. This is one of the destinations on the Louisiana African American Heritage Trail. Southeastern's Columbia Theatre in the Hammond Historic District, constructed in 1928 and renovated in the 1990s for $5.6 million, is a downtown cultural venue. The city was the home base for production of the first season of the NBC television series In the Heat of the Night, starring Carroll O'Connor. Known locally as the Depot, the Amtrak station dates from 1912. Refurbished with a raised passenger platform, the station offers direct service to New Orleans and Chicago on routes owned by the Canadian National Railway. Intersection of LA 1065 (North Cherry Street) and US 190 (East Thomas Street) in Hammond's Historic District: The building in the background is Dantone's Grocery, founded in 1912 by Italian immigrants. Lucius McGehee Hall on the campus of outheastern Louisiana University in Hammond is a sturdy example of Depression Gothic architecture. It is on the National Register of Historic Places. Hammond is located at 30°30′16″N 90°27′56″W﻿ / ﻿30.50444°N 90.46556°W﻿ / 30.50444; -90.46556 (30.504446, -90.465616) and has an elevation of 43 feet (13.1 m). According to the United States Census Bureau, the city has a total area of 12.8 square miles (33 km2), of which 12.8 square miles (33 km2) is land and 0.08% is water. The Hammond Police Department is headquartered on Oak Street. The city's uniform crime reporting statistics are available on the FBI UCR website. Hammond has suffered from exceptionally high crime rates for many years. As of the census of 2010, there were 20,037 people, 6,251 households, and 3,706 families residing in the city. The population density was 1,383.4 people per square mile (534.2/km²). There were 7,014 housing units at an average density of 550.1 per square mile (212.4/km²). The racial makeup of the city was 48.57% White, 47.52% African American, 0.16% Native American, 0.83% Asian, 0.02% Pacific Islander, 0.46% from other races, and 0.91% from two or more races. Hispanic or Latino people of any race were 1.57% of the population. There were 6,251 households out of which 29.4% had children under the age of 18 living with them, 34.9% were married couples living together, 20.2% had a female householder with no husband present, and 40.7% were non-families. 28.7% of all households were made up of individuals and 8.6% had someone living alone who was 65 years of age or older. The average household size was 2.51 and the average family size was 3.19. In the city, the population was spread out with 23.9% under the age of 18, 23.1% from 18 to 24, 23.7% from 25 to 44, 17.1% from 45 to 64, and 12.2% who were 65 years of age or older. The median age was 27 years, which is seven years younger than the statewide median age of 34.0 years. For every 100 females, there were 83.2 males. For every 100 women age 18 and over, there were 78.1 men. Ponchatoula Creek, the stream along which Peter Hammond settled, has figured prominently in Hammond's development. Here this footbridge crosses a tributary between Southeastern's University Center and spacious North Oak Park. The median income for a household in the city was $24,067, and the median income for a family was $31,617. Males had a median income of $30,625 versus $18,533 for females. The per capita income for the city was $15,145. About 24.9% of families and 32.8% of the population were below the poverty line, including 43.7% of those under age 18 and 19.0% of those age 65 or over. The Louisiana Office of Juvenile Justice operates the Hammond Office in Hammond. The United States Postal Service operates the Hammond Post Office. Southeastern Louisiana University (SLU), based in Hammond, is one of the state's regional universities and one of the city's largest employers. It was established in 1925 through the efforts of the educator Linus A. Sims, then principal of Hammond High School. The city is also home to Northshore Technical Community College. The city's public schools are part of the Tangipahoa Parish School System and include Hammond High Magnet School, Hammond Junior High, Eastside Elementary, Westside Elementary, SLU Laboratory School, and Crystal Academy (an alternative school). The Catholic Church operates two schools in Hammond: Saint Thomas Aquinas High School, which is just north of the city, and Holy Ghost Catholic School (pre-kindergarten through 8th grades). In addition, Trafton Academy (pre-K through 8th) and Oaks Montessori School (pre-K through 8th) are private schools serving area students. In 2018, press reports indicated that only 74% of the local population held high school diplomas. In this respect, Hammond ranks among the bottom 25 cities nationally and is comparable to Salem, Oregon, and Tucson, Arizona. With only 20% of people having a college degree, the city was in the bottom quarter nationwide in this ranking too. Hammond and its immediate environs have a number of hospitals, including North Oaks Medical Center on U.S. Route 51 Business between Hammond and Ponchatoula. North Oaks is one of the largest hospitals in Louisiana and helps serve the teaching needs of Southeastern Louisiana University's College of Nursing & Health Sciences. The Southeastern Louisiana Lions sports teams use multiple venues in Hammond. Chappapeela Sports Park hosts American football, baseball, basketball, lacrosse, soccer, softball and volleyball. Hammond has railways, highways (including the intersection of two interstates), and air travel/transport. Both the southbound and northbound daily City of New Orleans schedules have afternoon stops in Hammond, so Amtrak Superliner trains are a common sight. About 15,000 passengers use the station every year. Many are coming from or going to Baton Rouge, some 40 miles west. The Queen Anne-style station (1912), situated at the center of town, was renovated in 2008, with an ADA-compliant platform added soon after that. Interstate 12, from Baton Rouge to Slidell, is a shortcut for Interstate 10 drivers to avoid congestion in New Orleans. Interstate 55, from Laplace (west of New Orleans) to Chicago, also passes through Jackson, Mississippi, Memphis, and St. Louis. Hammond is 40 mi (64 km) from Baton Rouge, 46 mi (74 km) from New Orleans, 89 miles (143 km) from Gulfport, Mississippi, and 125 mi (201 km) from Jackson, Mississippi. U.S. Route 51 (Morrison Boulevard) splits from I-55 between Hammond and Ponchatoula and parallels I-55 northward through the city's western side. U.S. 51 Business, which follows the original route of U.S. 51, leaves the parent 51 south of Ponchatoula and rejoins it after meeting US 190 in downtown Hammond and forming a concurrency with 190 until it meets US 51. U.S. Route 190 (Thomas Street / Morris Avenue) parallels I-12 and goes east–west through the city's commercial and historic downtown areas. The Hammond Northshore Regional Airport has a runway long enough to land the Concorde (1976–2003) and to serve as back-up for Louis Armstrong New Orleans International Airport. The largest unit of the Louisiana Army National Guard is stationed at Hammond, adjacent to the site. The airport is also the home base for the 236th Combat Communications Squadron of the Louisiana Air National Guard. The airport has no regularly scheduled passenger service but is convenient for charter flights and corporate aviation purposes. "Hammond Song", written by Maggie Roche of The Roches, documents moving to Hammond after becoming disillusioned with the music industry. The climate in this area is characterized by hot, humid summers and generally mild to cool winters. According to the Köppen climate classification system, Hammond has a humid subtropical climate, Cfa on climate maps. ^ Hammond Historic District's home page. Accessed 25 July 2017. ^ Swedish-American Historical Quarterly, October 1967. Accessed 08 October 2015. ^ Hammond, Peter in Dictionary of Louisiana Biography, retrieved 02 August 2017. ^ Photo of historical marker on Find a Grave, accessed 08 October 2015. ^ StoppingPoints.com. "Hammond, Louisiana historical marker". Retrieved 12 March 2016. ^ Don Ellzey, Property owners stuck in Bombing Range: Corps surveyors search for any explosives in The Daily Star (Hammond), 2009 October 29, pp. 1A, 8A. ^ TV Guide. Triangle Publications. 1988. p. 10. Retrieved 17 September 2018. ^ "Police". Police. City of Hammond. Retrieved 23 November 2018. ^ "Crime Rates in Hammond, Louisiana". City Data. Retrieved 23 November 2018. ^ "Uniform Crime reporting Statistucs". Federal Bureau of Investigation. Retrieved 23 November 2018. ^ "Regional offices." Louisiana Office of Juvenile Justice. Retrieved on December 26, 2017. "42381 Deluxe Plaza, Hammond, LA 70403, United States"
^ "HAMMOND." United States Postal Service. Retrieved on December 26, 2017. "105 NW RAILROAD AVE HAMMOND, LA 70401-9998"
^ Sauter, Michael B. (21 August 2018). "Cities Where the Fewest People Graduate High School". USA Today. Retrieved 17 September 2018. ^ "Our Facility". playcsp.com. Retrieved 2018-09-15. ^ "Dr. Sally Clausen" (PDF). regents.ohio.gov. Retrieved October 7, 2013. ^ Karla Wood (November 22, 2014). "Former Lexington mayor H. Foster Pettit dies at 84". Lexington Herald-Leader. Retrieved July 8, 2015. ^ Himes, Geoffrey. "Maggie Roche: The Hidden Heart of The Roches". pastemagazine.com. Retrieved 2019-01-09. Wikimedia Commons has media related to Hammond, Louisiana.